Gone are the days of back-breaking hours of lifting heavy shovels full of snow! Made in the USA from lightweight 100 percent recyclable plastics, this snow removal product is extremely durable and user friendly. It works to push snow effortlessly from whatever surface it may be on by using your own body weight as the driving force behind it. This snow removal tool is made to withstand temperatures up to 140 degrees below zero before it will crack, chip, splinter, or break. The Big Blade's Unique design means no bending or lifting wet, heavy snow. This snow tool is perfect for towns, villages and municipalities to use for areas that may be too small for plows or where environmental impact is a concern. By using your own body weight, you can easily push the snow out of the way, or chop blue ice with minimal effort! Try the Blizzard Blade Snow Mover - the new way to shovel a driveway that saves you time and back ache, and you will never pick up a regular shovel again! - HOW IT WORKS - Simply start in the middle of whatever surface you need cleared and work side to side, this way when you reach the edge, the snow didn't have a chance to build up and get heavy. Then turn around and do the other side the same way. Another way to use this revolutionary tool is to angle the Big Blade by its offset handles and start walking. The snow will be directed out of the way and off walkways, platforms in minutes! This tool will also break up solid blue ice easily and it won't damage the underlying surface. For best results, always use the tool on the same side. This will help sharpen it and create a beveled edge on the tool as used. To clear platforms, simply grab the handles at an offset, which will angle the tool to direct the snow to one side and of the platform. Or, start at the center of the area to be cleared and work to one side and then the other, to prevent heavy snow buildup. Proceed until the area is clear. EASY TO USE AND LIGHTWEIGHT - Gone are the days of back-breaking hours of lifting heavy shovels full of snow! The Big Blade is made in America from lightweight recyclable plastics and is highly resistant to damage. Available in 32 and 40 inches, this giant snow shovel will quickly and cleanly clear your sidewalks, easily break up sheets of ice, and will get the job done faster, easier and neater than conventional hand snow shovels! REDUCES STRAIN WITH LIFTING - Greatly reduces strain, effort, lifting, and potential injuries common when shoveling snow - The BigBlade snow plower shovel's unique design means no bending or lifting wet, heavy piles of snow. Using it is simple, easy, and does not require backbreaking effort! This giant snow shovel pushes snow effortlessly from whatever surface it may be on by using your own body weight as the driving force behind it. 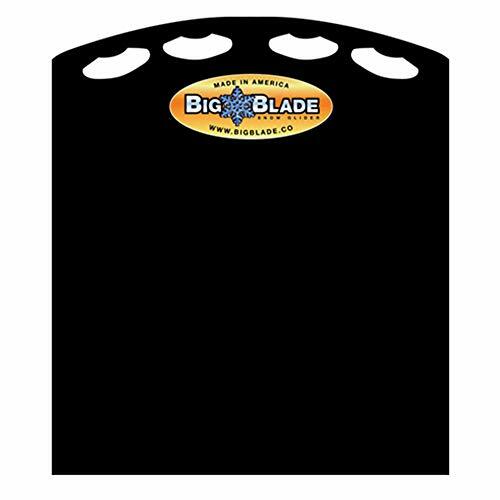 EXTREMELY DURABLE - Built to last through even the most extreme conditions, the BigBlade hand snow shovel can withstand temperatures up to 140 degrees below zero before it will crack, chip, splinter, or break. It's strong, sturdy construction and compact design allow for easy storage when not in use. If you have any questions about this product by BigBlade, contact us by completing and submitting the form below. If you are looking for a specif part number, please include it with your message.